Whistleblowing is acknowledged as one of the most effective ways of stopping wrongdoing. For example, many of the cases of corruption, fraud, and sexual abuse of children that we know about have been exposed by workers who reported these issues to their employers, regulators or the press. In fact, it is believed that more cases of fraud and corruption are exposed by whistleblowers than any actor – including the police or the media. 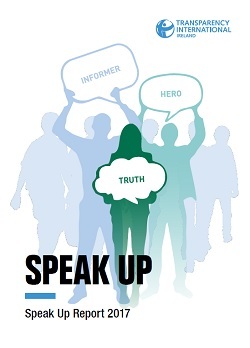 TI Ireland published our Speak Up Report 2017 based on data collected from over 850 whistleblowers, witnesses and victims of corruption who contacted the helpline. The report suggested that the risk of corruption and other forms of wrongdoing is relatively high in The Gardaí Síochána, the Health Service, and in the Banking and Finance Sector. The report includes the results of the first Integrity at Work survey, which for the first time measured the attitudes and experiences of Irish private-sector employees and employers to whistleblowing. TI Ireland also published a list of recommendations it has made on how the Protected Disclosures Act 2014 can be strengthened. The recommendations include; the extension of whistleblowing protections to volunteers and students; the removal of caps on compensation for awards to workers who are found by the Workplace Relations Commission to have suffered a detriment as a result of making a protected disclosure; and the reversal of the burden of proof to employers to show they were not responsible for the penalisation of a whistleblower. 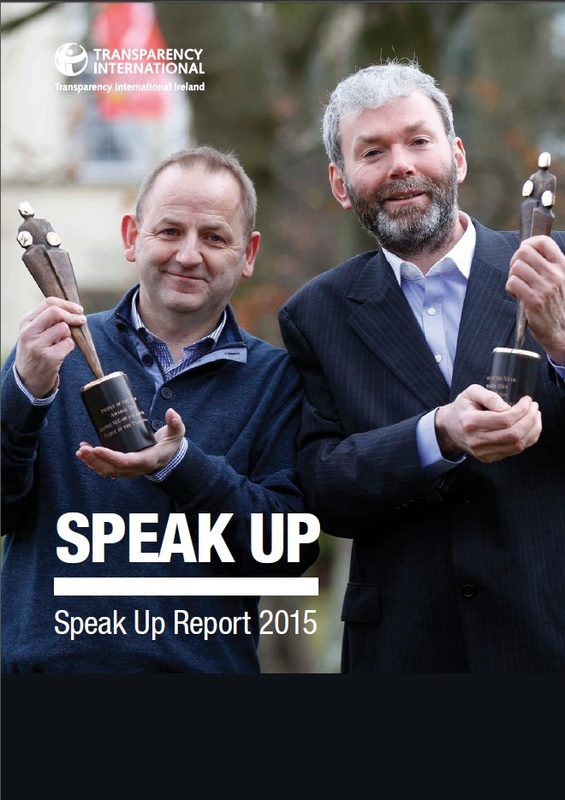 In 2015, TI Ireland published our Speak Up Report 2015 based on data collected from over 500 whistleblowers, witnesses and victims of corruption who contacted the helpline. The report suggested that the risk of corruption and other forms of wrongdoing is relatively high in Local Government and the Health Service, as well as Social Services including Charities. TI Ireland also published a list of recommendations to address systemic shortcomings that hinder efforts to combat corruption such as; Improving intelligence sharing among law enforcement agencies, providing additional investigative powers and resources for regulatory agencies, promoting Local Authorities statutory Fraud and Anti-Corruption Alert Plans, banning public officials from receiving gifts during their employment, and improving education and awareness on corruption. Transparency International Ireland (TI Ireland) has taken particular interest in the protections afforded to whistleblowers under Irish Law. 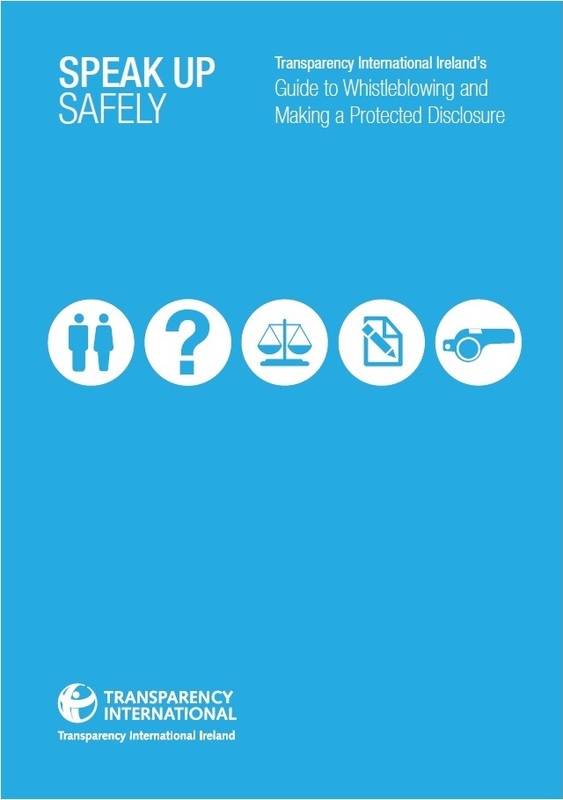 In 2010, TI Ireland published our Alternative to Silence study, which highlighted a number of important cases that demonstrate the shortcomings of the 'sectoral approach' to whistleblowing legislation. It accompanied the Transparency International report “Alternative to Silence – Whistleblower Protection in 10 European Countries” in which Ireland’s whistleblower safeguards are examined in a regional context. The study includes interviews with three prominent whistleblowers including Eugene McErlean, the former head of group audit with Allied Irish Banks. Mr McErlean reported overcharging and other wrongdoing at the bank, which he claims was then ignored by the Financial Regulator.